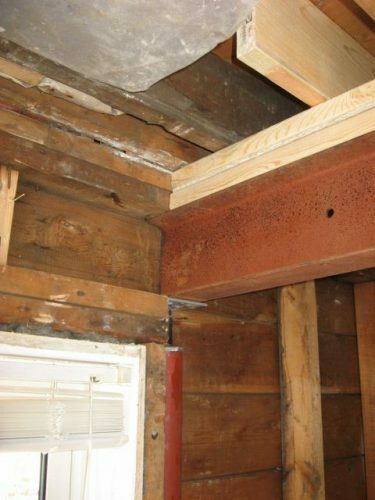 It is possible to remove load-bearing walls, as long as the load is carried by some other means (usually by a beam). The previous owner of our house did not understand that basic concept, and thought it okay to remove studs in order to put in doorways, cut top plates to run plumbing, and simply remove walls without paying any attention to the structure. Is it a load bearing wall? your house collapses when you remove the wall. The problem: Studs were removed from a load-bearing wall so a doorway could be inserted. In the same wall, part of the top plate was removed for the plumbing vent stack. There was some sagging due to the original wall studs being a little too short, which wasn’t a serious issue, but something we were able to address with the wall opened up. Top plate cut for vent stack. The solution: As part of our overall renovation, an even larger section of the wall was removed. It was replaced by a beam comprised of two 2x10s which now carry the load. A bulky header completes the load bearing stud wall. The plumbing was re-routed. An accurately sized hole was drilled through the top plate so the vent stack could run through it. The wall was reinforced with additional studs which helped to level the joists above. The load is carried by the foundation block walls and one of the new stud walls in the basement. New studs to level the floor joists. The Problem: In creating a larger master bedroom, the previous owner removed a load-bearing wall– an error that could have had very serious consequences. He should have installed a beam to carry the load, but instead he just left the top plate of the wall in place, which sagged by close to an inch over the years. The top plate had sagged significantly due to the previous owner removing the load bearing studs. 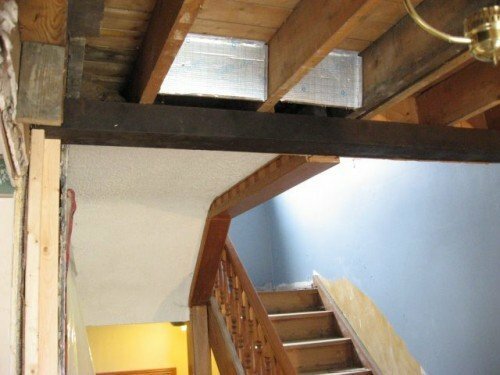 Oddly, he built a lower ceiling using a framework of 2 x 4’s and drywall. The 2 x 4’s were installed below the level of the top plate–I guess so the ceiling was all the same height– so he could have replaced the top plate with a 2×8 beam without sacrificing any head room at all. Likely a beam of 2×10′s or greater would have been required for this span, but even that would have only protruded a couple of inches below the lower ceiling. Solution: The obvious solution would have been to use jacks to raise the sagging top plate back up to level and restore the stud wall below it. But we had in our grubby little hands architectural drawings that changed the floor plan of this area yet again. A wall was to be built a few feet from where the original wall had been, so rather than install a beam and build a wall, the completely changed how the load of the second floor is carried. The new wall has been moved several feet and features a steel I-beam supported by jack posts that sit over the block foundation on one side and a block basement partition wall on the other side. This is our new load-bearing wall. Load-bearing steel beam supported by jack posts. A stud wall was built under the I-beam, but it is the steel that carries the load. New joists were installed between this wall and the other wall detailed above. The old joists are no longer necessary for carrying any load, but remain in place. The new joists are now the actual structure, the old joists are redundant. Meanwhile, in the hallway, we learned some more secrets of the house’s past which revealed more inadequate structure. The upper hallway is open, overlooking the stairs. 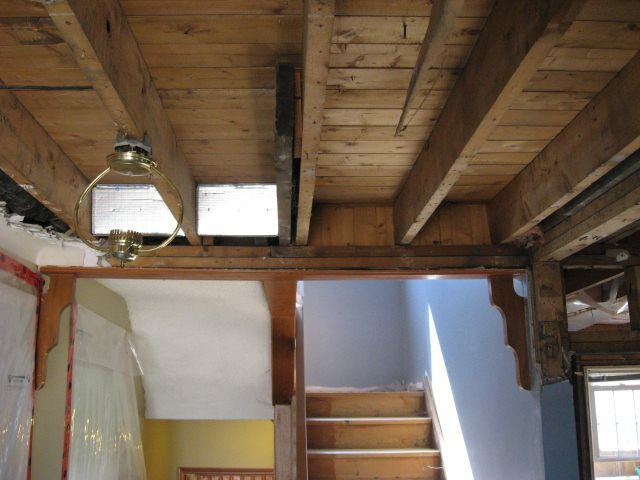 Where there should be a beam supporting the second floor joists across the stair opening, there was only two 2x4s which appear to have been a top plate at one time as the stud locations were clearly marked. Apparently, the staircase is not original to the house. If I had to guess, I would assume that access to the attic had been achieved via retracting attic stairs, and the proper stair case was installed at a later date. Two 2x4s were not enough to support the second floor above the hallway. The contractors installed an angle iron to reinforce the top plate, giving it the structural strength to properly support this span. Angle iron was installed to reinforce the structure. Restoring the underlying structure of this house started shortly after we moved in (2003) and continued to the Spring of 2009. Considering our “home inspection” focused solely on structure and apparently revealed no issues, we were completely blindsided by the scope of the repairs that were necessary. The cost of the repairs was folded in with the cost of extensive renovations that have enhanced the value of our house. However, had it not been for the structural issues, we would not have had to renovate so extensively. It is far easier and much less expensive to do things right the first time. A few hundred dollars worth of lumber would have saved tens of thousands of dollars worth of demolition and construction.